Alex is a self-taught programmer who is picking up Pascal quickly and is already teaching it to younger students. Not content with a basic implementation of hangman, he takes the trouble to display a scaffold and hanging man with ASCII characters. He also allows you to select word lists of varying difficulty. (Alex downloaded the longest word list from mieliestronk.com then selectively deleted items to produce the other lists. You might like to view these text files to see the wide range of targets, including some cities and a few phrases such as runofthemill and ragstoriches). Furthermore, Alex has developed a scoring system to encourage users to continue to play. This zip file contains the source code files, the executable and the three word lists. The following screenshot shows the gallows in action, and one further wrong guess will result in a loss. Can you guess the remaining letters? 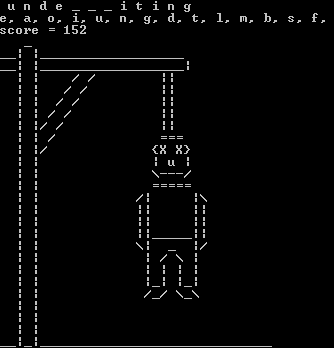 Immediately after executing Hangman for the first time, set the height of the console window as follows. Click on the icon at the top left of the console window. Set the height of the screen buffer and of the screen to 40. Close the console and run Hangman again to use the new settings. See the main program below then follow the links for the code of the units. //calling in crt in order to use the clear screen function.